The Suburban Style Life: Which barstool would you choose? Which barstool would you choose? 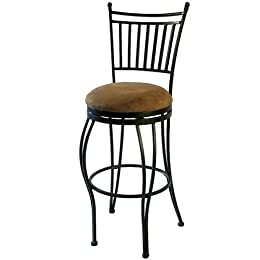 I am having a tough time finding bar stools for our kitchen island. I found two completely different options. Jeff likes the wrought iron stool from target because it swivels and I like the modern style of the black Crate & Barrel stool. The stool would be without the cushion. Which one would you choose for our kitchen?? ?